Choose "mature" colors: While pastels are lovely for a nursery, they often need updating in a few years. "Big boy"/"big girl" colors have greater longevity. You can't go wrong with neutrals: Colors that work for either gender means that your nursery will still work for Baby #2, 3, 4 (or your grandkids). Avoid "baby" themes: As he or she grows, your child will have ideas of his or her own on how their room should look. Select something simple that still works when your kid's tastes change. Select timeless subject matters: These can be incorporated into a nursery now, a bedroom later on, and perhaps even a dorm room or first apartment when your child is grown. 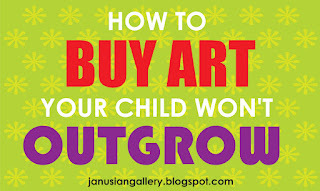 Consider emerging artists: the artist's reputation and the value of the artwork may very well grow right along with your child. Think beyond the wall: Sculpture, mobiles, quilts, and pottery can all work for kids of all ages. Just be careful of placement when your child is young. Don't forget durability: There may be grape juice spills, crayon "enhancements", etc. Can it be cleaned if need be? 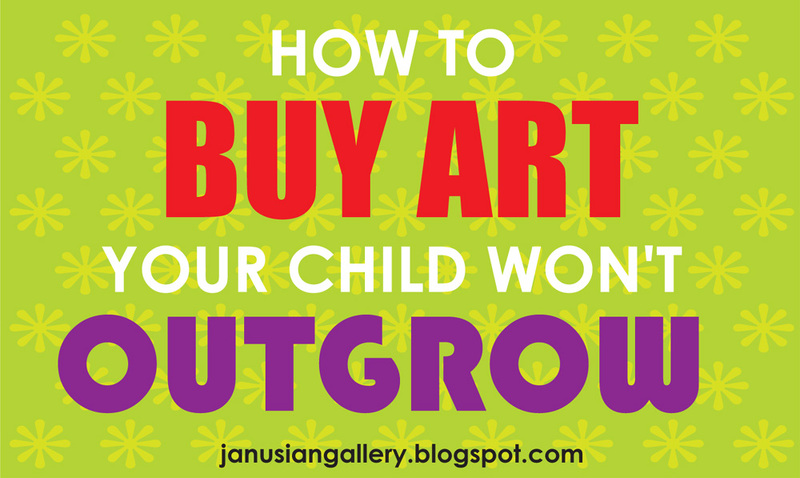 Investing in quality pieces is a great way to instill in your children an appreciation of the visual arts. It can also be a piece of you that they'll have long after they leave the nest.